Incident in January shows how Tesla big battery is already breaking the stranglehold of the gas cartel in South Australia’s electricity market. And for the first time, a wind farm bid in FCAS to keep prices down. On Sunday, January 14, something very unusual happened. The Australian Energy Market Operator called – as it often does – for generators in South Australia to provide a modest amount of network services known as FCAS (frequency control and ancillary services). This time, though, the market price did NOT go into orbit, and the credit must go to the newly installed Tesla big battery and the neighbouring Hornsdale wind farm. The call for 35MW of FCAS – usually made when there is planned maintenance or a system fault on the interconnector between Victoria and South Australia – has become a running joke in the electricity market, and a costly one for consumers. The big gas generators – even though they have 10 times more capacity than is required – have systematically rorted the situation, sometimes charging up to $7 million a day for a service that normally comes at one-tenth of the price. (You can read our reports on how they do it here, here and here, and for a more detailed explanation at the bottom of this story). The difference in January was that there is a new player in the market: the Tesla big battery, officially known as the Hornsdale Power Reserve, which bid into the market to ensure that prices stayed reasonable, as we predicted last year. And that’s not the only impact. According to state government’s advisor, Frontier Economics, the average price of FCAS fell by around 75 per cent in December from the same month the previous year. Market players are delighted, and consumers should be too, because they will ultimately benefit. Ed McManus, the CEO of Meridian Australia and Powershop Australia, which operates the Mt Millar wind farm in South Australia, says the Tesla big battery is already having a “phenomenal” impact. “If you look at FCAS … the costs traditionally in South Australia have been high …. and our costs in the last couple of years have gone from low five-figures annually to low six-figures annually. It’s a hell of a jump,” McManus said in this week’s RenewEconomy’s Energy Insiders podcast. “That plays into the thinking of new players looking to come into South Australia to challenge the incumbents. FCAS charges are on their minds. “It’s a little early to tell, but it looks like from preliminary data looks that the Tesla big battery is having an impact on FCAS costs, bringing them down … that is a very, very significant development for generation investment and generation competition in South Australia. “The South Australian government deserves a big pat on the back …. they have received a fair bit of flack – people saying if the power goes out, the battery can only power state for 5 minutes – but that is kind of irrelevant. There is no doubt that actions of the Tesla big battery in the FCAS market will please the government, which signed a contract with Tesla to address just this issue. (And may be able to repeat the dose with the newly announced 250MW “virtual power plant” also to be built by Tesla. If it can keep a lid on FCAS prices like it did in January, then it will likely pay back the cost of the battery in a single year from this service alone, let alone the value of its trading in the wholesale market, and the value of its emergency back-up capabilities. It’s just another string in the bow of the Tesla big battery, following its devastatingly fast response to trips of major coal-fired generators (it was in the market again on Saturday night after Vales Point in NSW tripped), its ability to go to capacity from a standing start in milliseconds, and its smoothing of wind output and trading in the wholesale market. These graphs below explain what has been happening in the FCAS market in the past year, and what happened on January 14. Let’s take September 14 as exhibit A. AEMO called for 35MW of FCAS for a well-advertised maintenance schedule, but the four big operators – AGL, Origin, and Engie – could only find 30MW of “low priced” capacity, despite having more than 400MW available. So the prices went into orbit. All told, according to the AER report, the bidding patterns cost around $7 million that day (See chart below for comparison with a normal day’s work). Sometimes the shortfall has been just 1MW or 2MW, but it sends the prices up nevertheless. The generators profit from the scarcity they create. This practice has been systematic for more than a year, and there has been at least 10 such events in the past 12 months. In January, however, after an initial spike, the Tesla big battery bid in at around $270/MWh and that’s where the market stayed. It probably saved around $3 million or more. What’s particularly interesting about this is that it was not just the battery bidding in, it was also the neighbouring Hornsdale wind farm – also owned and operated by Neoen – that bid 10MW of FCAS into market as it continues its trials sponsored by ARENA and AEMO. This is a huge development. There are separate markets for lower regulation, but for ease of purpose, we have chosen to focus on the raise regulation market only. But the results are the same for both. Can Elon Musk’s battery storage plant smash Australia’s gas cartel? A little bit of competition and transparency, and all of a sudden consumers are better off. Great story, thanks Giles. The pundits are already suggesting we will see retail prices fall Currently they are predicting around $200-$300 per year for average households. But we need supply contracts – both wholesale and retail – to start expiring before we know for sure. Onya Premier Jay for the vision and the action in getting it done…The Big Battery. Two Tongues Turnbull just keep s on keeping on with his tired old last century nonsense of “Left Wing Ideology and Idiocy” . Premier Jay and the good state of SA are showing the Two Tonguer and the rest of Australia what needs to be done to shake up the vested interests and gamers in the electricity industry. I begin to suspect Trumble’s bleating, and that of many of his cohorts, is in fact a deliberate ploy. While some of his idiots deny science and other facts, he allows them to speak as cover for their real purpose… wedge Labor and the Greens on regional jobs (Adani mine and others) while raking in all the coal lobby money for as long as they can. Meanwhile, the states have taken up the green energy mantle, taking us closer to meeting our international obligations, all while the federal government doesn’t have to spend money on it. So this is the impact off 100MW battery storage does, imagine what will happen when the proposed additional 250MW of distributed batteries and related solar equipment comes online in SA. Someone buy Jay a beer for standing up and making it happen. Just waiting to hear what spin Big Mal, Josh, Tony put on things. I am very much looking forward to the distributed solar & battery deployment; but I think the HPR has already provided the bulk of the benefit, the low hanging fruit. Distributed generation and deployment of a virtual power-plant will add great flexibility and resilience to the grid, and prices may drop a bit. I suspect that will be about the extent of it, though. More big batteries are planned (and under construction), and they will still be useful; but again, the big savings are already being delivered. The latecomers will deliver far less benefit per unit. Joseph – great comments. Energy generators will continue to add battery storage at generation facilities, however the next game changer is going to be when Electric Vehicles become grid connected and can form part of the “Virtual” pool of battery storage. To enable this to occur (excluding political and safety issues) – will be a power distribution company to begin offering this facility. This is happening in the Netherlands now. RESU or behind the grid batteries is exactly what the power generators are terrified of. They were most likely behind last years bid by “Standards Australia” who attempted to introduce rules forcing RESU batteries to be installed in fireproof structures and are clearly lobbying the Govt in an attempt to protect their businesses. Giles – look forward to a new topic on “The Virtual Power Grid”. This is why Tesla should create a new division “Tesla Power” and link ALL PowerWalls into a giant VPP. If Richard Branson can do it with Virgin ‘everything’ then Tesla could do it too. Why stop at cars, SpaceX, solar and powerwalls ? Virtual Grids and their management is a paradigm shift from today’s energy retailing model where they “buy from the few and sell to the many with a healthy markup on the way through”. VPP would have to be Tesla’s long term goal – Jay has the stage (and hopefully the public support in SA), which combined with considerable business interests needing/wanting a market in which to establish their first Virtual Grid, should make for an energy disruptive future! Agree — that’s ongoing revenue, for not much overhead. Would have to be part of Tesla’s long-term, or near-term goal. Would you not prefer to see an Australian owned company such as Zen energy do this? Musk is the hero of the moment, a real showman. I prefer our own quiet achiever, Prof Ross Garnaut. Better still would be public ownership. Of course that requires a change of government, but that’s coming. He’s been a warmist mouth for hire for generations. Looking at your comment history, I am deeply underwhelmed by your knowledge and insight. Top marks for snide, however. Mmmm. Australian owned, and between Garnaut and Gupta, and Aus Lithium deposits, that could well change. Are Zen price competitive with Tesla? I doubt it. As for Aussie owned, having just been burnt with a 25.38% power price rise in Jan 2018 by Red Energy (govt owned subidiary of Snowy Mountains Hydro) I’ve had enough of supporting the locals with maybe one exception… Tindo Solar in SA (depending on price). I’m in the market for my next PV array (6 to 10 kW depending on what will fit on my new roof). My calculation for how much battery was “needed” to eliminate these price spikes entirely was roughly 3x the Hornsdale Power Reserve. With the Big Battery plus Tesla’s “virtual power plant”, they’ll have a bit under that. The next battery to go in after that will probably still be able to help (probably one of the ones going in in Victoria), and after that, this form of rorting will be gone forever. “Too many solar panels will burn the sun out , so a ban on new solar panels being installed , commenced today ” said Mal , Josh , and Tony . And, so I repeat when will I be reimbursed for the profit “skimming” that has been allowed to continue with the complicity of the federal government. The NEG will sort it…? I think you have to realise that consumers are being gauged with everything they could possible buy or consume. Australia tax (on imports; to the point that a product costs twice what it cost in the US or EU), profit-maximisation, value-driven (value for them not you), any form of subscription, and the list goes on… have a look how prices on everything have increased the last two decades in particular. With electricity (which is beginning to change) consumers are forced to be price-takers, so they can push way past the actual point of buyer resistance. Exploitable customers, sitting ducks. Never. Historically, criminal skimming with the support of the government can be *stopped* but it is never *reimbursed*. Great news, great story, great kick in the teeth for the intransigent ideology and idiocy of the Coalition RWNJS. But please, please, Giles, invest in a proof reader. Or at least read over what you have written. The first few paragraphs are a disaster of excited, scrambled English. We all know what you mean, but we are friends of the HPR. It’s enemies will use those errors to claim you can’t even write proper English, so why should they believe you know what you are talking about. We know you know exactly what’s what. How you manage to produce this newsletter every day is a wonder. Just a little more vigilance. You can only fix what you know about, so I’m letting you know. Giles, check out Grammerly. It will flags grammar and spelling issues and makes correction suggestions in both document files and web forms, catching mistakes before you hit the save button. A question from ignorance. It sounds to me like the battery is in a no-lose situation every time because they offer a cheaper service with a guaranteed high profit margin every time. If the battery can mostly charge when the price is $0 to – $1,000, doesn’t mean they make ~$250 to $1,200? How often are prices so low overnight that they can do this? Even buying at $150/market price and selling at $270 sounds like money for jam for the generator. It is. The battery is making money, period. No lose situation. Great for both Tesla and Neoen. They only need to buy low when the wind is not blowing (basically whenever there is a high pressure weather system overhead). I am constantly puzzled how so many people played monopoly, with its water, electricity and railway stations, and how they constantly make money; yet, none of these folks opposes the sale of public assets. No matter what any politician might say: do not agree to any sale of public assets; health and education included. When is the PM going to admit he has it wrong. Give SA the credit they deserve. This is only the beginning of Weatherill’s plan to give the state long term cheap electricity. Never. His monumental hubris doesn’t admit the possibility that he could be wrong about anything. Remember his tanty on election night 2016? He doesn’t even give himself any wiggle room. Just comes out with grandiose, absolutist statements, when he doesn’t have to. He’s a qualified lawyer. He knows perfectly well that such a statement could be held to be contempt of Court. And the High Court did NOT so hold. Has he admitted he got that wrong? So don’t hold your breath. His sort never admits to error. Cheap electricity? Cheaper FCAS is no substitute for cheap electricity. Or perhaps you didn’t notice the price spikes on 18th/19th January that added over $100m to bills? Perhaps you missed the Renew article about how in the USA solar/wind with batteries is now cheaper than EXISTING coal. We won’t be that far behind. Then, yes, cheap electricity. Over the course of January, the time average RRP for SA was about A$125/MWh. (Demand weighted would be higher) You call that cheap? I didn’t miss the article, which compared subsidised renewables against taxed coal – apples and oranges – and took no account of intermittency. The weighted average RRP value of the output from Hornsdale wind farm was just A$58/MWh in January – less than half average market price. “taxed coal” you mean subsidized coal. “6.5% of global GDP spent subsidising fossil fuels, or $12m every minute” (this website /6-5-global-gdp-spent-subsidising-fossil-fuels-12m-every-minute-78351/). In any event, renewables continue to get cheaper, putting downward pressure on the price-gouging by the gen-tailers. As is already happening. Eventually cheap power. Subsidy: a PAYMENT. show me the PAYMENTS. Fossil fuels pay taxes (large ones in the case of oil) almost everywhere. Usually, it is only cooking and lighting kerosene for the poor that get subsidised as e.g. in India. Look dude, you’re flogging a dead horse. Renewables are the go. Let it go, move on, try and keep up. You just live in an Alice in Wonderland world, where taxes are subsidies and vice versa. Topsy-turvy. Subsidies: any gov action that improves profits. Any gov breaks, anything. You don’t get to define subside it already means anything that helps a company. 5.3T$ global fossils breaks per year (IMF). So you are subsidised every time the government reduces income tax or GST. You are also subsidised because you don’t pay the top rate on all your income, and because you probably have allowances that are not taxable. Subsidy junkie! Yes. Lower taxes than everybody elses is a subsidy. If against one group, it’s a gov break their competition. Like attacks on solar pv going on right now. GO read the IMF paper on the how they calculate the 5.3T$ in gov breaks that fossils get. I skimmed it, and found only the 5% of that they claim for help for roads and cars to be unwarranted, since EV’s will take advantage of that too. By intermittent, I assume you mean the coal power stations that keep falling over when the ambient temperature rises ? It would include those instances, especially when wind output drops close to zero as it frequently does in such conditions – enough to cause price spikes without the failure of a coal plant on top. See the charts. thanks Elon musk for dragging our country kicking and screaming into the future. Is there any concern about what the gas companies will do to balance their lost income? Sell even more of our gas overseas at half the price we pay here? Whatever they try to do, more and more sensible consumers will switch from gas heating to RC AIR con, from gas cooking to induction cook tops, from gas water heating to heat pump. Powered by their rooftop solar and increasingly, batteries. The poor will be left behind, helpless in the face of rising gas prices as the gas companies try to maintain their profits in a declining market. Something will have to be done to help them. Climate change denial has a cost. For the fossil fools, a very heavy cost. I know the ACCC want to ignore this but why isn’t this kind of behaviour by the big companies illegal? If the petrol companies all decided that petrol availability was short unless we all paid $5 a litre there would be riots. Or maybe not? We do seem to just put up with things in Australia. A few years back, petrol was $1.50 per litre and oil was $150 per barrel. Now, petrol is $1.50 per litre, with oil at $50 per barrel. They are screwing us too. Now compare $1.50/litre with the cost of generating your own power from solar panels and feeding that into your electric (Tesla?) motor vehicle. Suddenly the ‘cost’ drops to near zero. I look forward to the time when car companies are interested in selling EV in Australia. Yeah, just because it’s illegal doesn’t mean it’ll be *enforced*. The federal Liberal National Party is in bed with the people at the big companies who are making the profits, and so they allow it. They are operating “legally”, according to the rules of the NEM. Of course, by legally I mean they invent plausible reasons for keeping generators offline while their other plants bid in at exorbitant prices. Take your idea to Federal Cabinet. Here’s realism for you. Electricity 10 years ago was 17cents per killawatt. 10 years on peak time it’s 55 cents . This price hike has driven out car makers clothing textiles etc. One of the reason for the price hike is green subsidised energy. The government gives taxpayer dollars so you can put solar on your roof. Build wind farms And it’s a lot of money. Meantime it closes down coal power stations. Putting a massive burden on the consumer especially in summer. Now China us building coal fired power stations using our coal and their economy is booming and will for a long time to come. The government isn’t closing down coal power stations. It privatised the coal power stations and the new owners are closing them down, because they at their end-of-life and have become a costly maintenance nightmare. No one will build new coal power stations here because the LCOE is higher (and rising) than renewables with firming LCOE (which is falling). And btw subsidies are excluded from the LCOE comparison. That’s true. The government dosent want coal hence the higher taxes to make green cheaper but the govt. Still subsidised green energy. Anyway if green energy is so cheap then why is industry running overseas in drives or importing. Two reasons lack of supply and the high cost of electricity. Another thing is a tesla battery lasts about ten years. After that you have to replace it. A coal fired power station will go for 50 years . Incorrect. A Tesla battery lasts a MINIMUM of ten years. We don’t know how long they last, because the oldest ones are 10 years old — all we know is that they definitely last at least ten years. They probably last 20 years or more. Nobody can afford coal any more — it’s much too expensive. In most of the US, the cost of transporting coal alone is higher than the cost of a new solar farm. Hauling rocks is expensive. you know how you can tell that everything you have said is false? Because the only people who are pushing coal power stations are those who think someone else should spend money on it, every person who has money to spend has abandoned coal and embraced renewables because coal is more expensive to build and maintain. You are incorrect on so many points. Go away and do your homework. ‘A lie called global warming’ ? The reality is that ‘clean coal’ doesn’t exist. It was a myth promoted by Rudd that you lot persist with because you don’t have any actual reality to support your preconceived position. Would have to be a Moron , to build a “Clean Coal power station” Lots have tried , but went broke . Renewables are much cheaper to power a 21st century country . Coal can no longer be called cheap and base load power , Big and small batteries , along with Solar ,hydro and Wind power mix , will Kill Coal on price alone ! then they can start on the GAS MOBSTERS . Trouble is wind can never be baseload power. Baseload isn’t actually a thing, RenewEconomy has covered this extensively over the last 12 months. Baseload power is not desirable. It is the power the coal fired generatorskeep churning out overnight because to shut down and start up again is ruinous costly. It is the reason for oversized, off peak hot water systems. Somebody’s smart idea many years ago to mop up all that otherwise unwanted overnight power. Oddly enough, because in most places the wind continues to blow overnight, wind can indeed provide baseload power, but it is much better used to power pumped hydro storage than to heat water. Once all power generation is renewable, hot water tanks can become virtual batteries, mopping up excess daytime solar generation, so that more domestic pv output can be used, less power bought in overnight. Hettie – baseload power is simply the lowest level of demand in the system that always has to be supplied. Now, unless you plan on turning off life saving equipment in hospitals, etc. that is always going to be a positive number. In fact, the ideal would be if our power requirements were constant 24×7, because then we could get away with the lowest amount of capacity, and poles and wires to deliver it. Capacity factors would be maximised, and we would have the cheapest possible electricity because there would be no wasted capacity in the system. You ought to email the engineers and associated researchers at Princeton University. They found, with sufficient geographically dispersed wind-farms, the output on the grid becomes flat (as in constant, 24/7). Admittedly that was for the USA, but hey, I guess you’ve done sufficient research, and had it peer-reviewed, and published, that you can say otherwise. Which publication was that, again? 82 ameliorate (but not eliminate) the first challenge, i.e., wind variability. Basically, over large enough distances wind correlations drop to zero. That is not the same thing as producing constant output. 71 sub‐hourly (e.g., turbulent fluctuations and gusts). 100 probabilistic approaches for NWP. Good that you read the article, but your points are moot. When geographically dispersed wind is combined with solar, batteries, pumped hydro, hydro and biomass (quite a large contributor in Germany), power by any fossil fuel (be it coal, gas, diesel) becomes redundant. Your welcome to your opinions (I wouldn’t have them for quids), but they won’t make a hill of beans difference to going 100% renewable in a shorter time frame than most appreciate. Nice attempt at covering up your evident previous failure to read the paper properly in the first place. Now, perhaps you should do some sums on just how much hydro/pumped hydro you need to make a wind/solar grid viable without other backup. You ought also to catch up on just how damaging emissions wise biomass is. It’s far worse than burning unabated coal in the crucial decades before we’re supposed to reach the disaster tipping point on climate. You may like to note that the EU has just passed a law permitting the burning of whole trees as biomass. The motivation is purely the CO2 accounting madness that ignores the realities. No, no attempt, simply not bothered arguing the finer points of that paper. Obviously the SA gig would entail converting the solar via pumped in sea-water to synthetic fuels, hydrogen, ammonia etc. So dude, it’s only a matter of when, not if. Again, your opinions won’t make a hill of beans difference to the inevitably of renewables. Your opinions won’t overturn the basic facts of science and economics. Which is it, basic facts, or non-basic facts in your universe. Fact is renewables are replacing fossil fuels. And will increasingly do so. Yes. Fossil fuels went from 86% of global primary energy in 2015 to 85.5% in 2016, while renewables increased from 2.8% to 3.2%. Whatever the fossil fuel component of grid electricity, let’s say on average, across the NEM it’s 90%. I and others I personally know of, went from that 90% to 0%. That’s naught point naught percent fossil fuel use. No backup generator using filthy diesel, the particulate of which is quite debilitating to human health. No gas either. The system was over-engineered. Just solar, 24/7 power. For cooking, hot water, refrigerator, and the usual appliance load. Did I mention, 0% fossil fuel use? I admit I’ve still not bought a Tesla, yet. Working on it. So I don’t know where you get your figures, but they’re irrelevant to many happy folk. With you a “moot point” seems to be a fact you don’t like. I trust you enjoy your solar dependent lifestyle, especially when there are several cloudy days in succession. You didn’t mention a Powerwall, so I assume the house is dark at night, since the only way you can guarantee 0% fossil fuel use for your electricity is to be off grid entirely. Perhaps you visit your neighbours often? Well that new wind farm , with the LARGEST BATTERY in the WORLD ! seems to be making money , as well as keeping prices down and stopping the gas/ coal mobs from pumping up the price and holding back supply to pump the price UP ! No – the spikes are because of a lack of wind, as clearly shown by the chart. Looks pretty conclusive to me. If the wind generators weren’t there then there would be nothing to stop the gas generators would be gouging the market all day long. In the past, the wind generators weren’t in existence, so we have a factual basis to evaluate your claim- which doesn’t stand up, because there was sufficient dispatchable capacity to ensure competition, and the cost of generating power through that capacity was far lower than the prices paid in SA today. Prices were much lower. Fail. Prices much lower? Go back to 1999, 2000, and prices were double what they were in other states. Why? lack of competition, reliance on gas, and imports. Prices higher now cos gas still setting marginal cost, and gas twice as expensive and fossil fuel generators extracting extra margins across the NEM. Way to deal with this is more renewables, and more storage. Gonna be real interesting when all this new wind and solar comes in – even Frydenberg admits it will push prices down. And even more interesting when the three new batteries and the local pumped hydro comes on board in s.a.
Ah, so now you’ve flipped from wholesale prices to retail prices, which includes network costs and retail margins. Go on, show the jump in retail prices in coal dominant Queensland and NSW. They’re in the linked article. 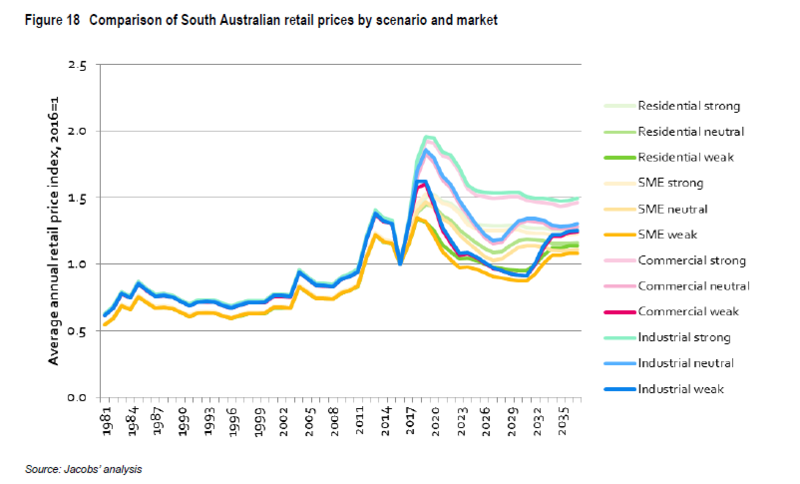 Fact is, prices were lower in SA before wind and solar became significant. You have tried to conflate that fact with the fact that prices in SA were higher than elsewhere. That they were higher than places where the power stations sit alongside coal mines and gas wells is only to be expected. Fuel is not transported for free. So you’re acknowledging that “he” would have to build a “clean coal” power station because private investors won’t go near it. That’s interesting. Human history and our society today is defined by the progressive introduction of disruptive new technologies: everything from the cultivation of grains, manufacture of bronze, discovery of cement, building of roads and aqueducts, substitution of machines for animal power, global mass transportation and cybernetics. Technological innovations were recognised by ambitious and imaginative leaders for the competitive advantages they conferred and were encouraged as though their kingdoms depended on it – financially and otherwise. Those with vested economic and/or emotional interests in the old ways of doing things have always complained, lobbied and resisted the new fangled ideas, to no avail. In just 250 years, stage coaches have given way to steam engines followed by cars and aircraft. In that time coal-based power has come and, in its turn, is now rapidly going. Reciting magical incantations such as “baseload power” will not change minds, markets or the eventual outcomes, but it may waste precious time and unity of purpose we can ill afford to squander. Well done, three lies in one sentence! Well if green energy is so cheap then factories schould be sprouting up everywhere. But no. They go overseas to the coal fired power stations of China. Cheap power over there. Guarantee of supply to. Not here in Australia. But we know better here don’t we. Large companies more and more are investing in renewable energy for their own use, and to sell, because it is so much cheaper than power from the NEM. If you visited this site to read the articles instead of just to troll, you would be aware of that. So either read and learn, or bugger off to your caves. Yes, but we’re ecstatically happy morons who are (some of us, and more joining every day) entirely off-grid, and loving it. So by all means carry on with your opinions. They won’t make a hill-of-beans difference to the stampede to install renewable energy. If fact, your opinions are quite entertaining, albeit mixed with sadness that you are so blind, or in so much denial over the efficacy of renewables. But not much sadness. Well, actually none, but I thought I should be conciliatory. If you see someone arguing with an idiot you actually have two idiots. There was no point fighting with the horse dung collectors in New York when cars emerged. Just contribute support for the positives. You have good thoughts to offer. Okay will add that to the list — a moronic idiot, who’s still happy being off-grid. Of should that be an idiotic moron? Calling people morons and idiots, dickwits and fools, is not going to make us value your opinions. It makes us despise you for a boor. AND I’m happy that my investment in rooftop solar means that I have not paid one cent to my supplier since December 11, yet I have prepurchased power to mid March, and a week in each of April, May, and June. Still $25 in credit, and the next FIT credit is due in 5 days. Those advance payments are almost covering the loan repayments for the system. I could be having payments to my bank account, but I’m buying ahead to cover the short winter days. Compared to the subsidies the fossil fuel industry gets, renewables get diddly squat. Mark Archer, You are another one who needs to go away and do your homework. I pay 26.21 c per kWh for power that I have to purchase. All 2.4kWh per day of it. And the FIT is 12.8 c, not 12.0. Time of day pricing is optional. An option I have chosen not to take up. My power costs were approximately $125 per calendar month. Repayments on the loan to pay for the system $160 pcm, for four years. Net outlay now is therefore $35 pcm, $90 LESS than before. In four years, I shall have a net income from the system, depending on future prices and FIT of course, but on current figures, of around $110 pcm. And I know that as far as climate change goes, I am part of the solution, unlike you, Mark, who are part of the problem. An ill informed, arrogant, patronising, RUDE part of the problem. As I said, go away and do your homework. And learn some manners. You keep quoting this “17 cents from a coal fired power station”. From what I can interpret you are basing that on the cost of power 10 years ago? But you clearly don’t understand that ten years ago (same as today) there is a lot of peaking power required on top of the coal generation – peaking power mostly supplied by gas fired generators. (The peaks are the largest cost events in the system by orders of magnitude.) Ten years ago gas peaking was cheap because we didn’t have an insatiable LNG export market bleeding the local gas market, therefore 17 cents power. But today gas is expensive because we now have an insatiable LNG export market bleeding the local gas market. Your fond reminiscences of 17 cents per kWh electricity are never coming back. You need to start blaming that on the real cause which is the insatiable LNG export market which starves the local gas market of supply forcing up local gas prices and therefore peaking electricity generation prices. Stop trying to blame clean energy which actually helps bring prices down in this high cost of gas power market. You are either a troll, considerably under-educated in the renewable energy field, a part-time volunteer conservative lobbyist or all of the above. You do realise you are on a website called ‘reneweconomy’ right? I know it’s hard to believe as it I find so myself, but coal is DEAD. Economy of scale has determined that. Not the ‘greenies’, not the left-leaning politicians. MONEY. I completely understand if your vested interests, career or news-corp material have made you come to your above agitated conclusion… but your comments about ‘clean coal’ will go through one ear and out the other here. And for what it’s worth. I was so disturbed by your comment and comment history that I made the effort to sign up to ‘disqus’ to just to reply to you. No one needs to call anyone an ‘idiot’ about their opinion on a public forum. Not even YOU. Actually I need to call someone an idiot at least once a day and then I get a good night’s sleep. Don’t worry I apologise later. Look I think we need this kind of robust discussion that we have here on this brilliant site, let’s get it all out in the open. I completely agree about the robust discussion Ren, especially if we all want to form an unbiased opinion! I’m happy for my assumption to be proven wrong, but nothing in Mark’s comment history seems robust to me. More he’s just here to shout his perspective to everyone, while not considering anyone else’s nor the CLEAR evidence that the economy of scale has finally tipped in favour of renewable energy investment over non-renewable in Australia. Anyone who spells “you’re” as “your” is beyond help. Yes, because spelling is the ultimate intelligence test. yeah, right. I could find no evidence that the battery was smoothing wind farm output. In fact, quite the reverse: it seemed to be adding volatility instead. Perhaps it is a trading tactic. Looks like the testing that was done with the battery in December 2017 or its when all the coal plants dropping out ? , due to the hot weather . But you knew that . Provide a chart that shows the battery balancing wind. This was actually the second half of December (16-29), when the battery was clearly no longer in test mode: its behaviour was similar in the first half of January too. One part of the battery (70 MW, ~30 MWh) is delivering FCAS, so it is responding to signals from AEMO. The rest is devoting to arbitrage, so buying low and selling high. Unless the wind farm is being curtailed, then there’s no reward for smoothing wind farm output, so I don’t expect they would be attempting to do that. Giles should not be claiming that the battery is smoothing wind farm output when it patently isn’t. That was my original point. It was of course a claim made before the battery came into operation that it would do so, so it is reasonable to look for it. I am not sure we really know what the other 70MW is doing. It rarely sees any action at all – the last time was identified as testing for ability to offer support should the Heywood interconnector go down. Mind you, I don’t think we really know what the 30MW is doing either. You need an insider view of the FCAS bid stacks to see what bids the battery was accepted for, and even more of an insider view to know whether it was actually called on to provide raise or lower service rather than standby. Almost the only things we can see with some clarity are the cyclical time shift trades (look at the MWh trace on my chart, which shows the cumulative charge/discharge) – but mostly, these make very little money. The 70 MW FCAS part of the battery has been very busy. Though it is often only providing 30 MW of power, so it is hard to distinguish from the 30 MW arbitrage part of the battery when you look at the output traces. This is why it the output of the battery often doesn’t seem to correlate with the price. The battery goes weeks without using more than 30MW of charge or discharge. What is the point of the other 70MW of capacity if it is so rarely used? The total statewide FCAS requirement in SA is just 35MW under a LOR2 condition – and less otherwise. The battery can only get a share of that. It seems to me that they are often bidding ~30 MW in the regulation part of the FCAS market, and a similar amount in the contingency part of the FCAS market. The contingency part only gets used if the grid frequency moves outside of the normal operating band, which rarely happens. This is why you don’t often see the battery charging or discharging more than 30 MW. Bidding is one thing. Having the bid accepted is another. Maybe electricity traders with their noses to their screens all day know the answers, but I don’t think we have much real clue: being shown a few minutes here and there is no substitute for looking at the overall performance – which can be done (and I do it) for the energy element. I don’t expect full transparency, TBH. There wasn’t any over what the battery really cost to begin with. Right. I believe your analysis is correct — thanks for it, since I was trying to get that clear in my head myself. Insider view is that the battery worked perfectly in responce to the market signals. Are you an insider? Mind you, I’d be kind of disappointed if my lights didn’t respond to being switched. I suspect more to the point here is trying to evaluate what the effect of the battery operations was on the network, and in what ways it was better and worse than the previous arrangements. I suppose they could use the battery to make the turbines spin faster. Once the energy grid also gets adapted to and served by domestic solar and the like, and potentially has something like Power Ledger in the system to set up an automated and seamless market for both buying and selling power from person to person using a blockchain, the grid will just be better and more equitable than ever. Sounds like Australia needs that more than most. There are two determined trolls on this site. Time to start down-voting them instead of dignifying their posts with replies. No , Paul. You are not one of the two. FCAS used to cost almost zero before the gas generators spied an opportunity to completely rort the market without any intervention. the regulator reports, documenting how the gas generators systematically only make 34MW (or less) available at low prices, rather than the 35MW needed, when they have more than 400MW on hand, just so they can send the price into orbit, is not about renewables, but market abuse, and a pathetically inadequate regulatory regime. totally agree however we are lucky they are still here to save grid and our asses. If I owned it I would have closed them years ago. Currently the people of france are subsidising SA s madness. You were happy for coal to close , why not gas . Look at yourself your answer is stupid. Before you nuts foist new world on us you should have kept coal going until you actually had a plan. You can always identify the Moscow right wing, weather down there in Australia or up in the US, by their resort, always, to name calling. Lets hope we can keep them out of, at least, this forum. You mean the ‘grid stability’ of the coal power plants that keep breaking down ? Needs diesel backup to save chickens lives in green blackout. Now before you start if its ok for jay WEATHER ILL to blow $80grand an hour on diesel keeping the lights why cant he put himself first. You green nuts forced it on him. Imagine how much said chicken farmer would save with solar panels on the roof of the chicken coops (which are usually enormous sun catchers). Even in Tassie the sun shines. $80k/hr is only when they are all running at full tilt, and only while they run on diesel. They will all be run on gas when moved to their permanent home. However, their real job isn’t to run at all, but to ensure private generators bid into the NEM at reasonable prices instead of leaving a generator idle and raking in the cash on another unit. The Adelaide load shedding last year happened while a gas generator was left idle. The generator blames AEMO and AEMO blames the generator. They had 4 days notice (minimum) of the high temperatures. There was no excuse for an idle generator, which would have eliminated the need for any load shedding at all AND simultaneously kept a lid on the wholesale price. You can bet that generator will run now under the same conditions, because the government generators will be fired up if they don’t, and we will bring in the dollars while they miss out.